If any more evidence were needed of the disingenuous nature of the NRDC gang, it’s provided in a recent Catskill Mountainkeeper appeal to fight this pipeline. The Catskill Mountainkeeper is out with a message to its supporters to fight a 7.8 mile Millennium Pipeline extension to a natural gas plant nearing completion in Orange County, New York. The messaging couldn’t be more disingenuous, so much so that I’m willing to call it outright lying—a word I don’t use that often. What’s behind it is a campaign to frustrate further development of the Marcellus Shale; to keep it away from lands the NRDC gang, of which the Mountainkeeper is part, wants for itself. The NRDC gang, as I like to call them, is a collection of Rockefeller family capos. It includes the Natural Resources Defense Council or NRDC, of course, which has been run by family members and associates from the beginning. It also involves the Open Space Institute (OSI) from which New York State DEC Commissioner Joe Martens came, and then immediately went back to join again after completing the NRDC mission. OSI is run by a Rockefeller descendant, while its Catskill Mountainkeeper spin-off is run by Ramsay Adams, son of long-time Rockefeller agent and NRDC founder John Adams. The boards of directors of these groups are interlocking and there is also a close relationship with Robert Kennedy, Jr.’s Hudson Valley Riverkeeper group. Kennedy, Senior NRDC Attorney, sits on the Mountainkeeper board, while John Adams sat on the Riverkeeper board as does NRDC’s Kate Sinding today. Kennedy, of course, is Andrew Cuomo’s former brother-in-law and uncle to his children. Current DEC Commissioner Basil Seggos was a long-time Riverkeeper hit man. The whole group operates in tandem, all at the pleasure and direction of the Rockefeller family, which is heavily invested, personally, in the Catskills. They seek to return it to wilderness as their own playground. Marcellus Shale development is a gigantic obstacle to those plans. Every time a new natural gas plant or new user of this natural gas appears, it provides an additional outlet for the gas and ensures the industry will be around that much longer. This raises land prices and gives landowners in the Upper Delaware and greater Catskill regions options for holding onto their land. It is a clear and direct threat to making the wilderness the Rockefeller family/NRDC gang wants. Therefore, they fight it with everything at their disposal. The CPV Valley natural gas plant being completed at the interchange of Routes 17 (I-86) and I-84 in Orange County is one of those threats because it will use large quantities of natural gas to feed the growing electrical power needs of the New York City metro area. It will also help replace the Indian Point nuclear facility Cuomo has engineered a deal to close. The plant is close to completion and Millennial Pipeline has had an application into DEC for nearly a year for the same 401 water quality certification the agency has used to halt the Constitution and Northern Access Pipelines. Millennium, having witnessed the patently obvious political games Cuomo and Seggos have played in those two projects, wisely decided to play hardball. It went to court the moment it saw DEC playing games and got a decision out of the D.C. Circuit Court of Appeals affirming FERC could act on its own and, together with Army Corps of Engineers, authorize construction of the seven miles of pipeline if DEC failed to act. This forced the DEC hand and they promised to act on the certification request before the end of this month. Last week, we wrote to you about a huge victory with the Constitution Pipeline, but until we are living in a state and country that doesn’t rely on the dirty gas and oil industry, and supports 100% renewable sources of energy, we’ll need to continue to work together. For over 5 years, the front-line activist groups like Protect Orange County and SCRAM have been leading the fight to stop to the $900 million Competitive Power Ventures (CPV) gas-fired power plant and collateral infrastructure projects. Today, at this critical juncture in the fight, we are urging you to join us in opposition. For the next week, we need your help to call on the Governor and the NY DEC and tell them to say NO, and deny the 401 Water Quality Permit for the $900 million Competitive Power Ventures (CPV) gas-fired power plant in Orange County, NY. Reaching the DEC and Governor is urgent. 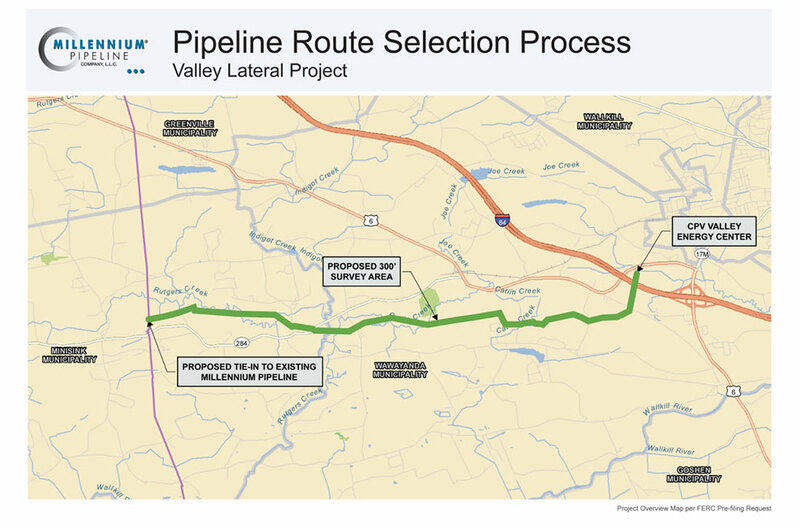 The CPV plant is very close to completion, and needs only this water quality certificate, to drop a 7.8 mile Valley Lateral Pipeline – a connector line – to the Millennium Pipeline and begin operations. The Valley Lateral Pipeline, if constructed, will risk an area of complex wetlands where the DEC in process of updating its wetland maps. The Pipeline will also slash across multiple streams, aquifers, and protected farmland. CPV would be fueled by fracked gas from Pennsylvania, burning approximately 130 million cubic feet of gas and emitting 7 million tons of carbon-dioxide-equivalent contaminants annually. We can’t stand to let our air quality worsen and risk our water for the greedy needs of the oil and gas industry. So now is the time to let the Governor and DEC know, we won’t be quiet on this issue. We say NO! We have stood against fracking NY. We worked to shut down plans for the Constitution and the NED Pipeline. So why on Earth would we want this project to move forward?! With your help, we’ve won before and we’ll win again. Let’s put an end to increased oil and gas infrastructure in the state and not allow fracked gas from other states to come in and threaten our environment, and say NO to the CPV 401 Water Quality Permit. Thank you for your time and commitment to helping stop the competition of CPV, and to the continued support of our work here at home! Why do I suspect DEC will not issue the certification? Simply because Basil Seggos, like his predecessor Joe Martens, is one of them. He’s also a former member of Cuomo’s highly political Governor’s Office staff. Cuomo will do nothing to offend the NRDC gang. Ramsay Adams would not be sending this e-mail if he didn’t have the blessing of Seggos to do so; if the whole thing had not been coordinated. It’s possible, of course, Cuomo and Seggos want an opportunity to turn down the NRDC on this particular project as a way of looking more legit on Constitution and Northern Access. There could well be a behind-the-scenes deal along those lines where the NRDC gang agrees to mount some token last-minute opposition to improve the optics for Cuomo on other projects. I’m more inclined, though, to still believe Cuomo a/k/a Corruptocrat, the quintessential Machiavellian, wants FERC to pre-empt him on all three pipelines. He wants to look good for the NRDC gang and still get the gas. Turning down this little pipeline a few days late because of supposedly mounting opposition is the most likely route to that highly desirable outcome for him because the case for it is so strong. Contrary to the false action alert put out by the NRDC gang, the pipeline will not worsen air quality. Rather, it will, in addition to help replacing Indian Point, also help replace electric power generation using oil, which generates significantly higher emissions. There are numerous power plants in New York that still use petroleum, for example, to make electricity (e.g., Barrett, Far Rockaway, Northport, Ravenswood, Roseton). More to the point, the CPV power plant its already authorized to burn oil if gas is unavailable. The owners have announced they will do so unless and until the pipeline to deliver much cleaner natural gas is completed. This will happen soon, given the fact construction is almost done. The plant is not going to just sit there. It will burn oil instead and, as is noted on page 9-45 and 46 of the CPV environmental impact statement the results will be very nearly the same because the emissions from the facility are capped anyway. Moreover, oil generates roughly 38% more carbon dioxide, despite the seven million tons of hyperbole from the Mountainkeeper. What this e-mail action alert shows more than anything, though, is that air and water quality are irrelevant; no more than head fakes designed to deflect true believers and other useful idiots from what’s really at stake for the NRDC gang. They’re not worried about these things. Rather, they desperately want to stop or at least slow Marcellus Shale development before it spreads to New York or the Upper Delaware region of Pennsylvania where their land holdings and desired land holdings are located. That’s the reason why—the only reason why—they oppose the Millennium Pipeline extension. It would “allow fracked gas from other states to come in,” improving the prospects of that Marcellus Shale development and threatening their wilderness aims. That’s what it’s all about. Notwithstanding all this, the Millennial Pipeline extension is likely to be approved by FERC, if not DEC. The NRDC gang will have gained, though, by delaying things if nothing else. Corruptocrat will have also established his radical environmental bona fides for a Presidential run while getting the gas to offset Indian Point. This is New York State, where nothing is as it seems and nothing is not political. The overlapping, incestuous (intellectually speaking or ideology of) networks are a serious problem. Everyone in this environmental world knows everyone else, so to speak. Which is very likely why misinformation spreads like wildfire throughout the networks and also might explain why people are not opening their mouths about this antifracking movement. It likely means calling out friends or “allies” as they say. Perhaps even disagreeing with an ally at this point is taboo as well? Whatever the combo is, this antifracking pipeline resistance movement is a serious societal problem. It has caused incredible chaos, promotes mass misinformation , advocates for positions that are detrimental to the environment even and is anti democratic and more. People need to know that the information they receive from groups like catskill mountaineeeper is gobbledygook. The small world nature of this movement is apparent to anyone who takes the time to look. Perhaps josh fox has never met pramilla malick. However his mother did years ago. The Left: lie, cheat, and steal… If only these unpatriotic posers could be forced to go without energy for a few months. Talk is cheap.